The Southeast Assocation of Telecommunications Officers and Advisors has announced Christopher Mitchell will receive its 2014 Community Broadband Advocacy Award at its upcoming conference on March 24 and 25 in Raleigh, North Carolina. I am honored to receive this recognition alongside Jim Baller and the Georgia Municipal Association, with whom I have worked on several occasions to further the public interest. I've long wanted to attend the SEATOA conference and hope readers will join me there. SEATOA is a regional chapter of NATOA - the National Association of Telecommuniations Officers and Advisors. I am excited to travel back to North Carolina after several years away from the state, to see how networks like Wilson's Greenlight have progressed and to learn more about efforts to expand universal access to fast, affordable, and reliable Internet connections. 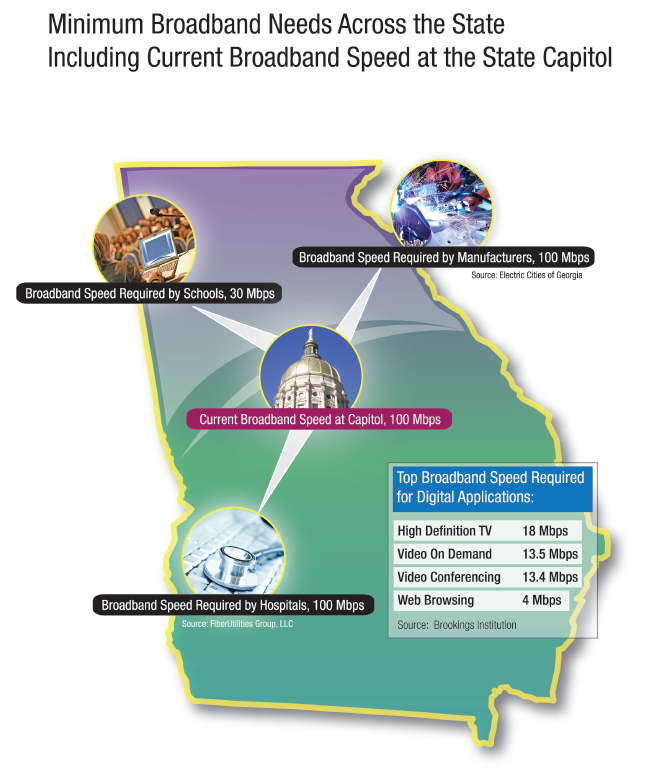 After AT&T began pushing a bill in Georgia to revoke local authority to decide to build a publicly owned broadband network, the Georgia Municipal Assocation (GMA) and the SouthEast Assocation of Telecommunications Officers and Advisors began reaching out to Georgia's legislators to explain how the private sector has left serious gaps in broadband coverage, which stopped the bill. Below are two flyers they report being particularly helpful. GMA, SEATOA, and the Institute for Local Self-Reliance are among the vast majority that believe communities should decide locally if a community network makes sense to bring next-generation connections to local businesses and residents. Georgia is a conservative state and AT&T had enlisted the support of the Senate Majority Leader in pushing their anti-competition broadband bill. Unfortunately for AT&T, their CEO was too candid on calls with Wall Street, contradicting AT&T's lobbyist talking points in Georgia. Note, that AT&T was originally trying to define broadband at the absurd 200kbps level but a substitute bill would have bumped it up to a still-too-low 768kbps, which is referenced above. 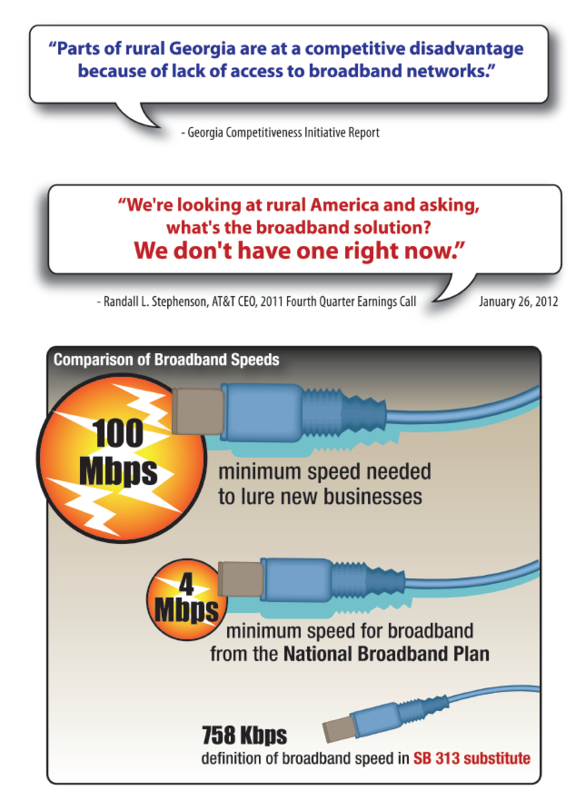 Rememeber that elected officials often think of broadband in binary terms. You have it or you don't. In their mind, if you have options aside from dial-up, the problem is solved. These are people that often do not know what is needed to attract economic development, work efficiently from home, or successfully compete remote education courses. The SouthEast Association of Telecommunications Officers and Advisors has its annual conference in Chattanooga this year - March 12 and 13th. The conference includes a tour of EPB's Gigabit network (the largest muni network in the nation) and its PEG operations. This conference will undoubtedly be buzzing about the legislation in South Carolina and Georgia that aims to shut down community networks just like North Carolina did last year. Deena Shetler, the associate Chief of the FCC's Wireline Competition Bureau will be giving the keynote. Give it a look if you are in the neighborhood. Success! After a few nerve-wracking months, North Carolina's state government has decided not to preempt local communities from building the broadband infrastructure they need. The full legislative explanation of how this standoff ended is available from Stop the Cap! as narrated by Catharine Rice. We all benefit from the efforts of Catherine Rice, Jay Ovittore, and many others to ensure communities can maintain their self-determination in the information age. These grassroots efforts, coupled with several key Representatives and Senators, have once again prevented incumbents from consolidating their market power by outlawing competition from publicly owned networks. Make no mistake, well-funded lobbyists will continue pushing for these changes both in North Carolina and in many other states. We should encourage the US Congress to "clarify" (in the words of the FCC) that states have no right to prevent communities from building this important infrastructure. Thanks to Catharine Rice, who tipped me off to FCC Commissioner Mignon Clyburn's presentation at the SEATOA Conference yesterday. SEATOA is a regional group of states from the southeast of the US that are part of NATOA. Commissioner Clyburn noted that the FCC and the National Broadband Plan oppose state preemption of local broadband networks. Thus, the Plan recommends that Congress clarify that State and local governments should not be restricted from building their own broadband networks. I firmly believe that we need to leverage every resource at our disposal to deploy broadband to all Americans. If local officials have decided that a publicly-owned broadband network is the best way to meet their citizens’ needs, then my view is to help make that happen. One example of a town that took control of its own digital destiny – Bristol, Virginia saw additional jobs created in that area. And last month I heard Lafayette, Louisiana’s City-Parish President, describe the development of economic opportunities in his city, that were a direct result of the fiber network built by the community. Right here in North Carolina, I understand that Wilson and Salisbury are trying to invest in fiber optic systems, that they hope will transform their local economies. When cities and local governments are prohibited from investing directly in their own broadband networks, citizens may be denied the opportunity to connect with their nation and improve their lives. As a result, local economies likely will suffer. But broadband is not simply about dollars and cents, it is about the educational, health, and social welfare of our communities. Preventing governments from investing in broadband, is counter –productive, and may impede the nation from accomplishing the Plan’s goal of providing broadband access to every American and every community anchor institution. I can only hope that North Carolina's Legislature listen to this speech before they vote on preempting communities from building broadband networks. However, as documented at Stop the Cap, Time Warner and other telcos are able to talk pretty loudly with their campaign contributions.